This pattern is shown in an old catalog of the Czechoslovakian company, Josef Inwald. The edge of the 12-sided base has a registration number. There are 6 1/2-inch, 8-inch and 10-inch versions. The pattern was named by the late John Britt but some catalogs refer it it as Coronet. 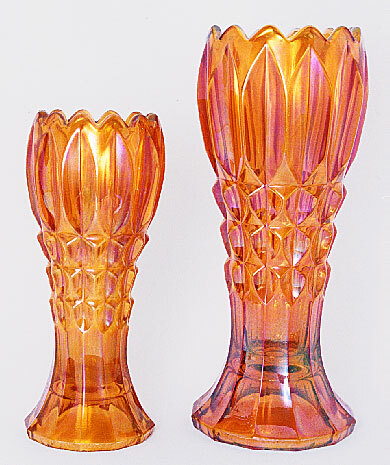 Ten-inch vases have sold for $800 and $900 in 1998 and 2000, respectively. 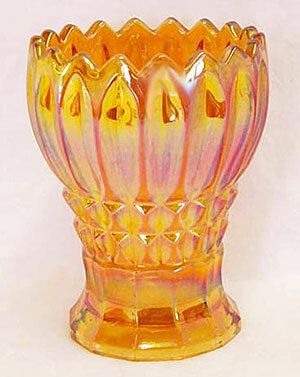 An 8-inch example, with minor damage, brought $125 in 1999 and in 2005, a 10-inch vase sold for $225. In 2007, it resold for $200. In 2016, a vase listed as 10 1/8 inches tall sold for $250 while another one the same size with a base chip and nicks brought $140. Last updated 1/20/2017 Although the size wasn't stated at the auction where this Princeton vase sold in 2014, it is obviously shorter than the above mentioned sizes. It brought $200.